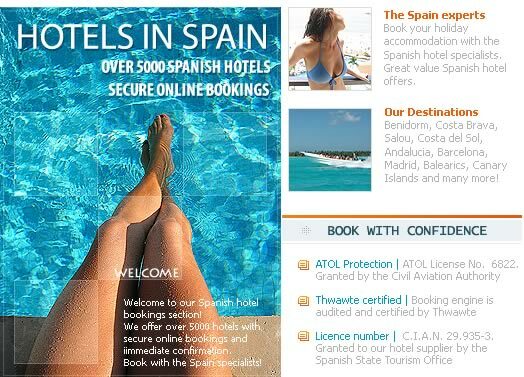 Book Spanish hotels from the Spain specialists - make a reservation at over 5000 Spanish hotels. This section of our site lists only Spanish hotels. With over 5000 hotels on offer, bookings are made securely and in real time with immediate confirmation. Bookings are made via a Thawte certified web site which is audited and certified by which means that the information sent online is encrypted and secure. Spain - a beautiful and diverse country. Each year over 50 million tourists visit Spain and the country is now the third most popular holiday destination in Europe. Although well known for great beach resorts mainly in the South of the country. Spain also has a number of beautiful cities and towns worth visiting. Examples of popular cities include Madrid, Barcelona, Granada, Sargossa, Valencia and Seville. Spain is a country that has a fantastic mix of art, culture and architecture and destinations that vary in culture, language, climate and customs. Spain caters for tourists extremely well - Travel is easy with plentiful accommodation and restaurants. Add to this the great climate, friendly people, long beautiful beaches and great places to see - makes a Spanish holiday one of the most popular and enjoyable holidays for millions of travelers. Prices are for accommodation, and when selected, meals only. Prices DO NOT include flights, transfers and insurance.